Thank you for visiting the Publicity Team's page. We are dedicated to creating a presence for Avatar on the internet and spreading the news about our great MUD. On this page we will keep you updated with our efforts and a list of all the sites that we have a presence on. If you wish to embed a image link into your webpage, have a look at our previously prepared banners in the Banner Repository. In addition to embedding banners, we also encourage the use of our promotional flyer as a way of marketing Avatar online and in the real world. To see a copy that you can print out, click here. We recommend placing the flyer in campus computer rooms, libraries, local coffee shops or any other places that you enjoy playing Avatar (pending it is okay to do so under the rules of the individual establishments). On April 24th, 2014 we added the MUD to the Mudverse listings website. In April, 2014 the Mediawiki project was completed, with articles on several sites. In Spring, 2014 advertising was purchased on Facebook. In Spring, 2014 an online client app for AVATAR was added to Facebook. In 2013, our Facebook activities really took off. 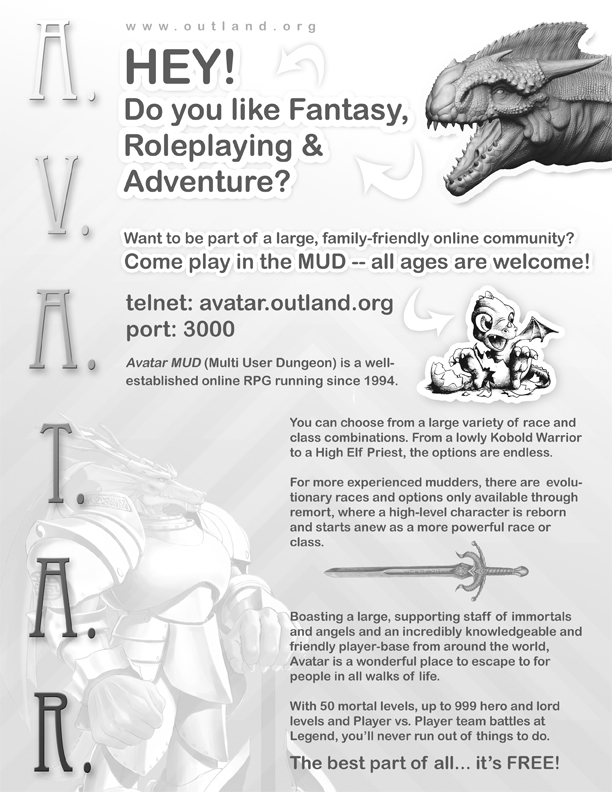 On May 1st, 2010 an Avatar promotional flyer was added to the Publicity home page. On January 4th, 2009 AVATAR was #1 on MudLists. Thanks for voting! On November 14th, 2008 we added a new voting button for Mud Lists, thanks to Ebnodon. On August 16th, 2008 the Avatar Publicity Team's Wiki page went live.